Happy Monday everyone! So this weekend sure didn’t disappoint, as can be expected from the legendary Monaco F1. 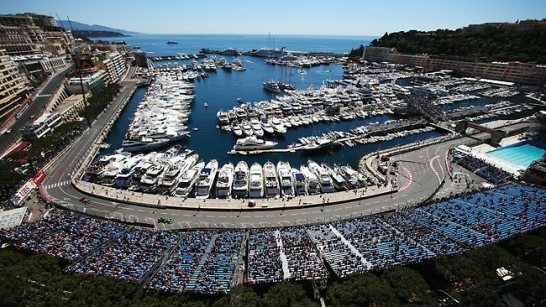 With an ambient temperature of 18°C and a track temperature of 41°C, Monte Carlo’s splendid harbor was bathed in glorious sunlight. 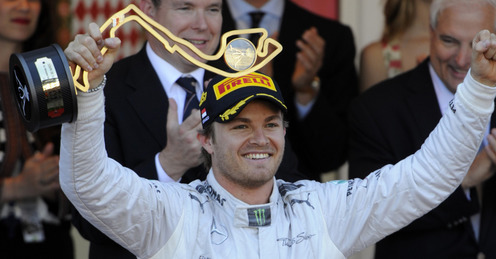 So on to the big winner of the day, Nico Rosberg. A sublime performance all weekend for the German, essentially sealing his victory on Saturday afternoon after once again out qualifying his more illustrious teammate, Lewis Hamilton. Rosberg’s victory came 30 years to the day after his father, Keke Rosberg, took the checkered flag in 1983. Second across the line was Sebastian Vettel after a great drive from him in both qualifying and Sunday’s race. There was not much that could be done to get past the Mercedes of Rosberg, but Seb did well in getting himself and Webber in between the two Mercedes teammates. Seb’s teammate Webber also had a solid drive, finishing third on the grid. Webber generally goes very well around Monaco, having clenched victory here last year (2012). One of the more unfortunate drives of the day belonged to Lewis Hamilton, who himself said he just wasn’t good enough in yesterday’s race. A bit of a disappointing result considering that he started on the front row along with Rosberg and just couldn’t maintain the gap needed to keep the Red Bulls at bay. Personally the star driver of the day for me was Adrian Sutil, who managed a great 5th place, his best ever race result for Force India. Sutil made some fantastic and clean overtaking moves, often catching drivers napping while he went for the pass at a circuit where passing is exceptionally difficult. It wouldn’t be formula One if there was not some sort of team mate war going down and this week Button and Perez were at it again! The Brit was once again moaning over the radio about Perez’s aggressive driving style with some gusty (or stupid) overtaking moves. Button was not the only bloke unhappy about the cheeky Mexican’s driving style. Kimi and Alonso both voiced their unhappiness about Perez’s risky moves, which ultimately caused the Mexican to retire after a collision with the ice man towards the end of the race. Perhaps Raikkonen could have left Perez some space but the Finn made it clear that the youngster wouldn’t spring a move like that upon him. Another disappointment came from the Ferrari garage, with both Alonso and Massa not having a great weekend. Alonso seemed to get overtaken left, right and centre. This was one of his poorest performances in recent memory. Things didn’t go too well for his teammate either who had a carbon copy of his free practice 3 accident, which put him out of qualifying. From the outside it looks like driver error but I suspect there is more to that crash than meets the eye. I am glad Massa is doing alright, with nothing more than a slight pain in his neck, as he reportedly declared. Grosjean was too busy admiring the scenary! The most baffling moment of the race was Grosjean (fondly referred to as Crashjean) driving straight into the back Australian Daniel Ricciardo. Grosjean is lucky to not have launched himself into the air and causing serious injury to himself or other drivers. Sources say that the Frenchman is on a three race rolling contract with Lotus. This last performance in Monaco, with him being involved in four incidents, would mean that the future looks anything but rosy for him. In true Monaco style we saw safety car after safety car ‘interrupt’ the race and after Max Chilton’s Marussia blocked Maldonado causing him to fly into the barrier, the race was red flagged. Getting back to race winner Rosberg – with all the interruptions he timed the restarts perfectly, kudos to him. One of the major features that I noticed in Monaco was exactly how slow the lap times were, even at the peak of the race. Cars were lapping an average of 6 to 7 seconds slower than qualifying as all the drivers were purely conserving tyres, with most of them opting for a one stop strategy as track position is paramount in Monaco. Vettel proved this point by setting the fastest lap, well over 2 seconds faster, showing what can be done if drivers are allowed to push. Vettel was met with a scolding race engineer radio message that you don’t get anything out of setting the fastest lap, to which Vettel replied, except satisfaction. Cheeky yes, but after all we are watching racing and it doesn’t feel like us spectators are getting the real idea of what these monster machines can do. Controversy sparked on race weekend about Mercs ‘secret’ 3 day test with Pirelli after the Spanish grand prix, and unhappiness was evident from other teams after their win this weekend. Red Bull and Ferrari have officially launched a complaint concerning this, and reports are indicating that the FIA is furious with both parties involved in the controversy. A fun filled weekend to remember, which leaves me wanting more! I am really looking forward to the Canadian track in 2 weeks time! Have a great week everyone.